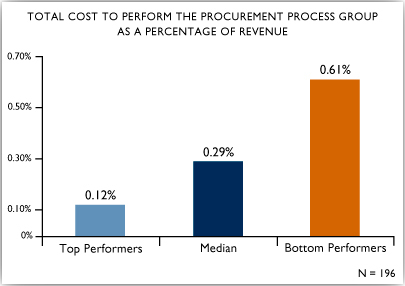 Many procurement departments have gone as far as they can when it comes to leveraging price savings out of suppliers. Complete the Procurement Open Standards Benchmarking Assessment and help your department become a core competitive weapon and increase shareholder value. transaction amount per purchase order . There may be a fee associated with your participation. For more information, please check the Open Standards Benchmarking fee schedule. All submissions to APQC's benchmarking database, both Open Standards Benchmarking and Rapid Performance Assessments, must be collected using APQC's easy-to-use Microsoft Excel data collection instruments. Please download a fresh copy of the assessment file from the menu above by clicking the “start assessment” button. Each benchmarking assessment offers an Excel-based data collection tool consisting of the survey itself, the measures associated with the survey, the glossary terms needed to understand the survey, and a copy of the Process Classification Framework (PCF) relevant to the data collection instrument. The consolidated data collection tool is intended to simplify the collection of benchmarking data within your organization. Once you have completed the data collection instrument, simply upload the file using APQC's secure file upload tool. Visit this URL to upload your file: https://zurl.co/8Rg92. If you are unable to connect to that web site, please contact the helpdesk for more information by sending an email to osb@apqc.org. Please do not send privileged, confidential, or non-public data to APQC via email. Please review our frequently asked questions or contact the helpdesk on osb@apqc.org if you have any further questions. APQC analysts will immediately begin validation of your submission.